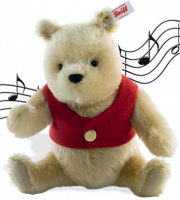 Steiff Disney Pooh - Loved & Adored! "I am famous & gorgeous in bright yellow with red jumper"
He is made from the finest blond mohair and is 5 way jointed (which means can move his arms, legs and head). He is wearing the red shirt which Pooh is so famous for in his wardrobe! Disney based on the Winnie the Pooh works by A.A. Milne and E.H Shepard. 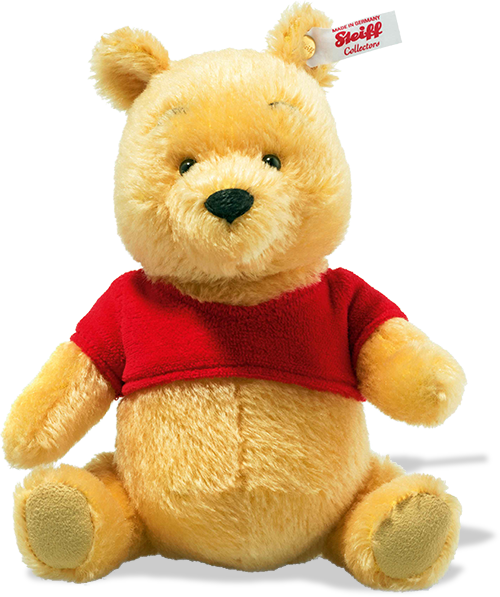 In the early 1960s, Walt Disney was able to acquire the rights to A.A. Milne’s Winnie the Pooh. Because Walt fondly recalled reading the Pooh stories to his daughters, he was pleased to bring the character into the Disney fold. Under his supervision, Pooh’s design was “modernized” for his first screen appearance in “Winnie the Pooh and the Honey Tree”, a 1966 theatrical short subject. Pooh’s new “look” in this film would become the definitive version of the character for a new generation of fans – those born from the 1960s through today. Limited edition of just 2,000 pieces for UK and America.